Let his art inspire your reading. 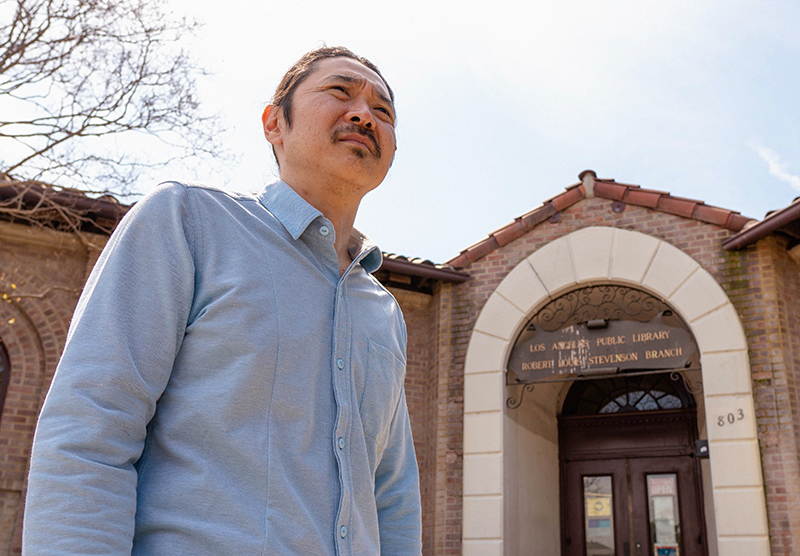 As a child, Gajin Fujita dreamed in the aisles of his local library in Boyle Heights, reading about the Japanese folkloric heroes and legends that would later play across his celebrated paintings. Those paintings grace museum walls in Los Angeles, Switzerland, Greece, Australia and Belgium. Now, you can put one of his artworks in your wallet; to celebrate the place that still ignites his imagination, the Los Angeles Public Library has teamed with Gajin to create a limited-edition library card. Grab one before they’re gone at any of the Los Angeles Public Library’s 73 locations. When you visit to get your masterpiece, take a minute to browse our aisles. Who knows what we might inspire in you. 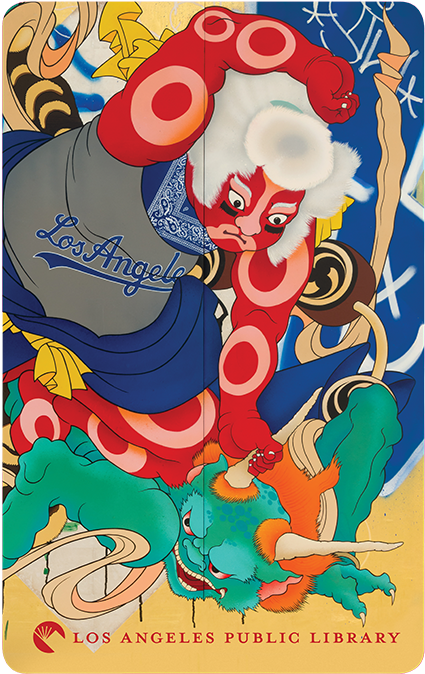 A native of East L.A., Gajin Fujita first established himself on the streets of Los Angeles with graffiti crews KGB and K2S, but his earliest artistic influences were informed by his father, who was a painter, and his mother, a conservator of Japanese antiquities. Rooted in those collective aesthetics, Fujita continued his artistic pursuits to earn a BFA from Otis College of Art + Design (1997), and an MFA from the University of Nevada, Las Vegas (2000). His works reside in public collections worldwide including the Art Gallery of New South Wales, Sydney, Australia; the Getty Research Institute, Los Angeles; UCLA Hammer Museum, Los Angeles; Los Angeles County Museum of Art; Pacific Asia Museum, Pasadena; Kemper Museum of Contemporary Art, Kansas City, MO; The John and Mable Ringling Museum of Art, Sarasota, FL; The Metropolitan Museum of Art, NY; Toledo Museum of Art, OH; Prospect New Orleans, LA and the Ulrich Museum, Wichita, KS. I’ve always been interested in creating works that express dualities and how they might coexist—combining old and new, high and low, east and west. My painting, “Guardian Angel” (2016), is an example of how I bridge opposing motifs through the layering of imagery. As a second-generation Japanese American, I found myself drawn to the Japanese folkloric heroes and legends that I came to know through my parents, who immigrated to Los Angeles from Japan; my father was born in Hokkaido, and my mother is from Tokyo. These stories and traditions were very much a part of my upbringing. In this work, the central figure is Kintaro or Golden Boy, a mythical child known for his uncanny strength. He was a protector of the common folk, a champion of the people and is a symbol of bravery and courage. This composition is based on an ukiyo-e print by Tsukioka Yoshitoshi, dating from 1868. I feel honored to contribute my artwork for this special-edition library card. Growing up in Boyle Heights, the Robert Louis Stevenson Branch was a refuge for me and my brothers. At that library, there was a Japanese American librarian named Pearl who really looked out for me. And beyond access to books and magazines – the library had air conditioning on hot days! The library made a big impact on me as a kid. It’s where my imagination and curiosity were stirred, and it began to open up my mind. Going to the library was liberating—from reading Mark Twain’s “Tom Sawyer” to looking at reference books of animals, or flipping through a National Geographic and coming across amazing pictures from around the world. I’ve always been very visual, even as a youngster, so the images were really inspiring. What is the LAPL “art library card”? 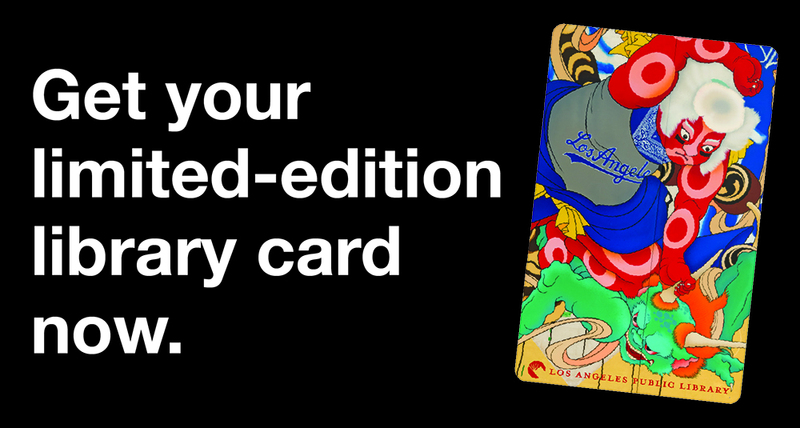 LAPL has created a limited edition of 100,000 library cards featuring artwork by L.A. artist Gajin Fujita. When will the art library card be available? The card will be available at all 73 libraries beginning Friday, April 12.
Who will receive the art library card? Anyone who applies for a new library card will receive the art card, while supplies last. Can a patron exchange his/her existing card for the art card? Yes. People with an existing library card can pay the $3 library card replacement fee and exchange it for the art card while supplies last. How will the art card be distributed? Each library will receive an initial supply of art cards. When an agency reorders cards, it will receive the new card while supplies last. How will the art card be promoted? The art card will be promoted primarily through social media, following a launch event with City Librarian John Szabo and artist Gajin Fujita on Friday, April 12. This is the second artist card issued by LAPL; the first featured the art of Shephard Fairey and Cleon Peterson and was released in 2016. The card’s image is a detail of Fujita’s painting “Guardian Angel,” which features Kintaro, or Golden Boy, a mythical child known for his uncanny strength. Kintaro was a protector of the common folk, a champion of the people and is a symbol of bravery and courage. The composition is based on an ukiyo-e print by Tsukioka Yoshitoshi from 1868. A native of East L.A., Gajin Fujita established himself on the streets of Los Angeles with graffiti crews and continued his artistic pursuits by earning a BFA from Otis College of Art + Design. His works are in institutions worldwide including the Getty Research Institute, UCLA Hammer Museum, Los Angeles County Museum of Art, The Metropolitan Museum of Art, NY, and the Art Gallery of New South Wales, Sydney, Australia. Contact LAPL Public Relations & Marketing Office at 213-228-7555 or pubinfo@lapl.org.